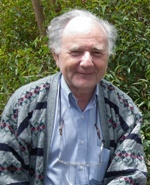 John Endler is widely held as one of the world’s leading evolutionary biologists. He was instrumental in showing how geographically varying elements can cause divergent evolution and speciation, despite significant gene flow. His experimental evolution studies of sexual seduction and natural selection on colour patterns of guppies were groundbreaking, and his demonstration of the modes and strength of selection in the wild has spawned a generation of research into selection in natural populations. His work on colour vision has revolutionised our understanding of how animals perceive the world, and he has pioneered the new science of Sensory Ecology.